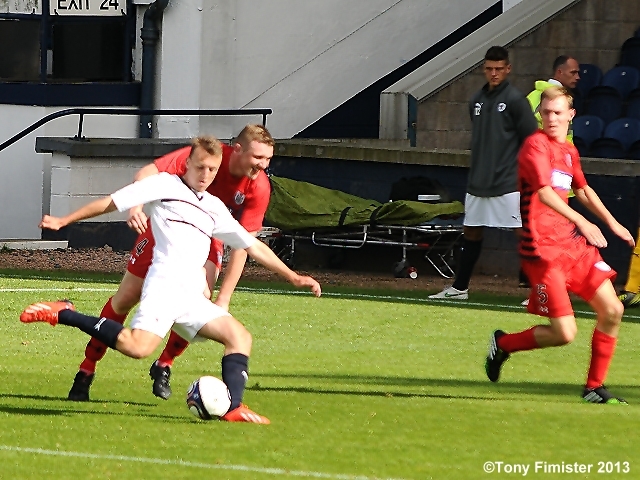 Calum Elliot scored twice in a goal-rush at Starks Park as Raith brushed aside League Two Queen’s Park to book their place in the Scottish Communities League Cup second round draw. Goals from Smith, Cardle, Spence, and Vaughan rounded off a pleasing afternoon for Grant Murray’s side in the Starks Park sunshine. 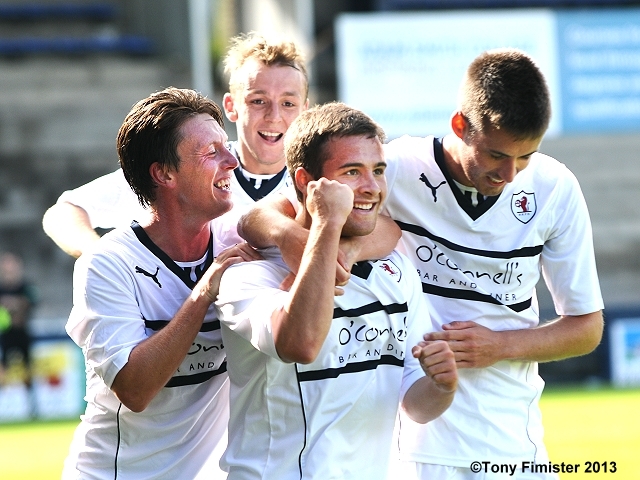 In a day of high-scoring across the country, Raith were in command from their opener in the fifteenth minute. A terrible day for Queen’s was compounded with the needless sending off of midfielder Capuano after the hour. Manager Grant Murray named an unchanged line-up following last week’s last-minute Ramsdens’ Cup victory over Stirling Albion. Greig Spence started on the bench, with the new front pairing of Gordon Smith and Calum Elliot being trusted to lead the line. David McGurn continued in goal, with new signings Fox and Moon continuing their impressive midfield partnership. 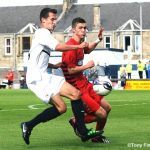 Queen’s Park, who missed out on promotion to Division Two last year following a play-off defeat to Peterhead, are rebuilding following the departures of talented teenagers Andrew Robertson and Aidan Connelly to Dundee United. Manager Gardner Spiers has a thin squad to work with this season, and may find the coming term one to consolidate rather than to drive toward promotion. Spiers would have been pleased with the bright and energetic opening from his young side. 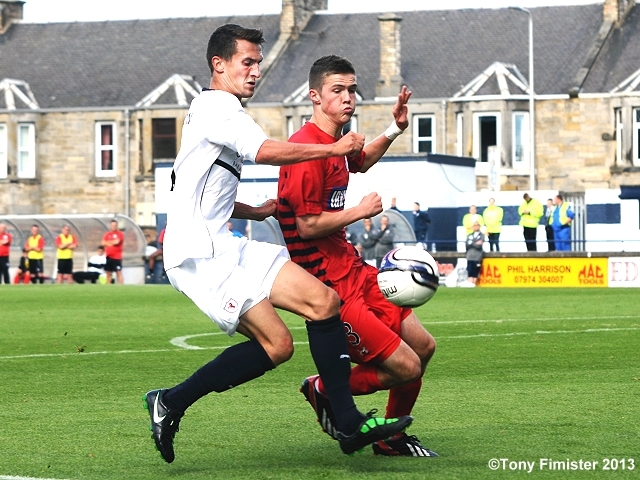 In contrast, Raith started slowly. The visitors’ tricky midfielder Shaun Rooney sparkled in the opening minutes, creating an early chance for Anthony Quinn to blast high over. Left-back Spittal shot wide from a quick free-kick as Raith’s defence struggled to get to grips with their opponents in the early stages. Rangy front-man Joao Victoria’s movement freed him from Dougie Hill’s attention several times as the away side settled first. 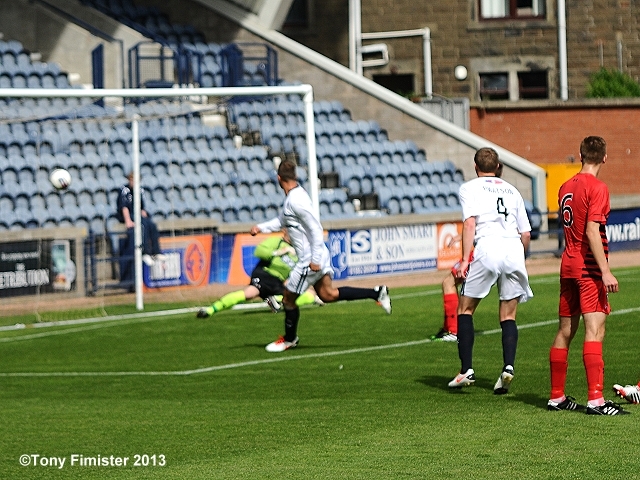 Gordon Smith opens the scoring. 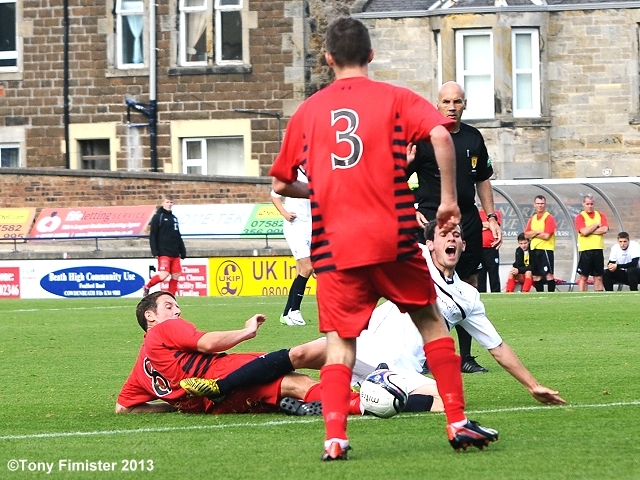 If anything, Raith’s opener was against the run of play. Smith and Elliot combined well on the edge of the visitors’ box, drawing a heavy challenge on Smith from Queen’s Park centre-half Keenan. 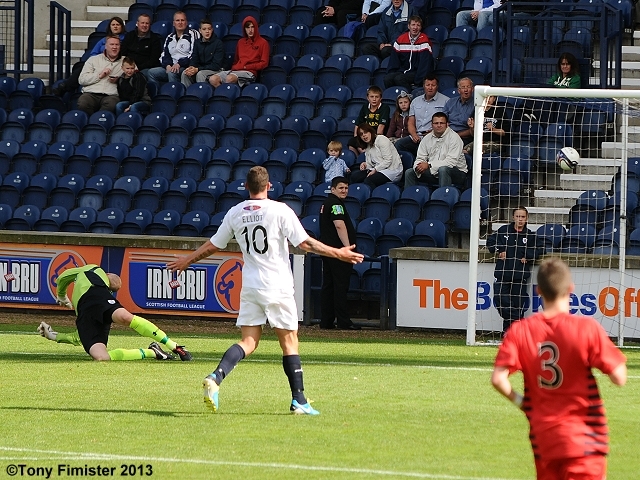 Following the free-kick, Cardle centred and Smith’s deflected shot evaded Brown to put Raith’s noses in front. 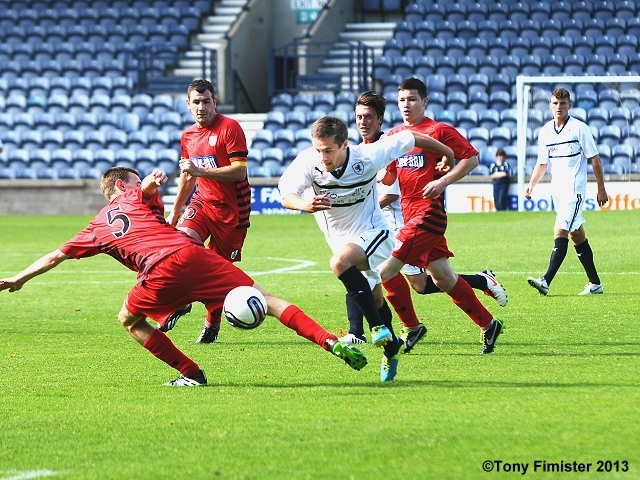 From that point on, Queens retreated, allowing Raith to dominate. 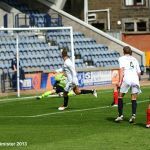 Thomson and Grant Anderson worked dangerously down the Raith right-flank, and from one of several first-half corners, Fox brought a splendid save from Michael Brown with a 20-yard drive that looked destined for the far corner. Moments later from a another home corner, Moon’s goal-bound shot through a ruck of bodies had to be hacked clear. 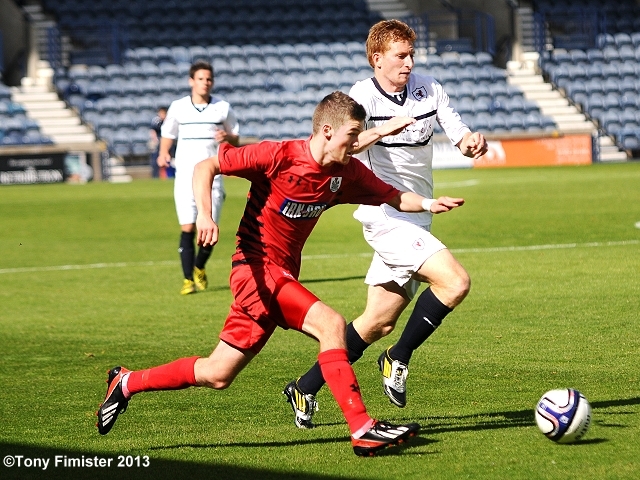 On Raith’s left, Callum Booth looked to have licence to fly down his wing whenever the opportunity arose. With left-winger Cardle cutting back inside so often, the two provide an excellent and variable combination. Both Smith and Elliot also showed willingness, dropping short and wide to provide options inside, allowing Booth the freedom to torment his opposite number. The difference between the sides became ever more apparent as the first half wore on, as Queen’s lost the foothold they had gained in the opening spell. 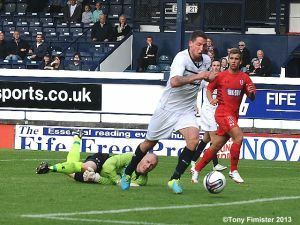 Cardle, having an influential game and seeing much of the ball, crossed for Smith to head straight at keeper Brown. On twenty-eight minutes, Smith looked to shoot, only to be bundled over under close attention from Keenan in the away-side’s rear-guard – referee Finnie was uninterested. 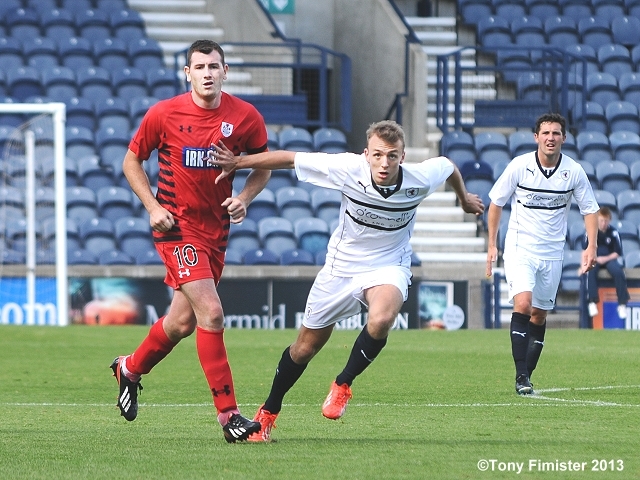 Queen’s Park did fashion two chances of note after first falling behind – David Anderson drove at the heart of the Raith defence after profiting from a mis-placed pass; he fed Victoria who’s low drive was excellently turned away by McGurn’s strong right hand. 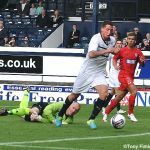 On the half-hour, McGurn weakly punched a Capuano cross to the feet of Rooney – the Queen’s midfielder should have shown more composure with his finish, clipping the ball meekly back into the arms of the grateful Raith keeper. At the other end, Booth and Anderson fired cross after cross into the visitors’ area. Elliot’s shot on the turn was palmed away by Brown; Cardle fired just wide from distance with Brown scrambling across his goal; and, having been released by Fox, Elliot was caught in a tangle with retreating defender Greig. 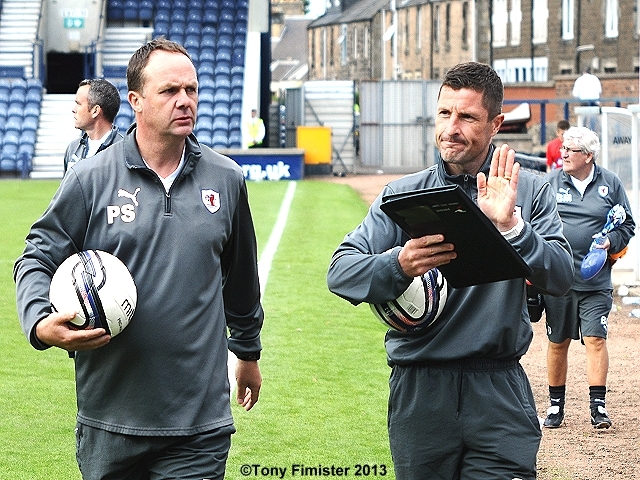 With Raith fans baying for the award of a spot-kick, again Finnie waved away protests. Watson headed close after a succession of Raith corners, Cardle’s thumped effort from an angle required another good block from Brown, and Elliot went close after good combination work from Smith and Anderson. 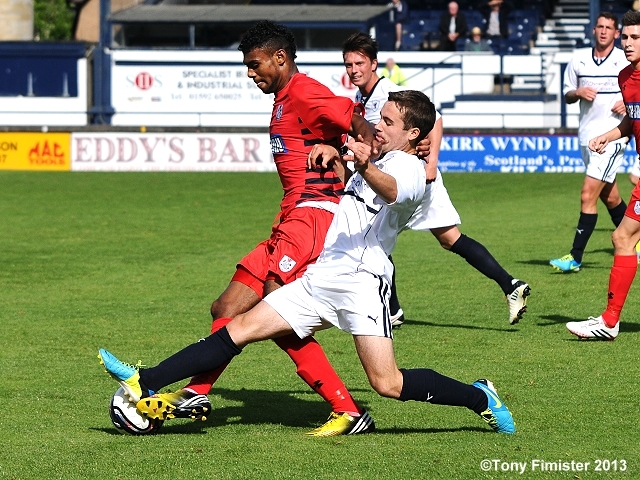 Raith’s mounting pressure eventually brought a second goal ten minutes before the break. Elliot and Smith linked well to send Cardle scampering beyond the away defence to fire home emphatically with his left foot. 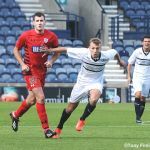 The second half began as the first had closed – Raith pressure, neat passing in midfield, and Queens’ struggling to maintain sufficient possession to create any momentum. Fox and Moon had been effective later in the first half in winning possession and releasing runners – particularly impressive was the speed at moving defence into attack and switching the play to move the focal point for the next raid upon Brown’s goal. Two minutes in, Elliot was muscled off the ball when bearing down on goal; and from the resultant corner, a chaotic episode followed with Moon inches away from heading home, a shout for handball, and defender Greir hoisting clear under pressure from Smith. On forty-nine minutes, Cardle ran into the heart of the visiting defence, drawing a foul. His free-kick was blocked by Brown, with Smith being blocked in trying to reach the rebound. Claims for a penalty came more from the supporters than the players, but the sense that Raith were in command was clear to all. 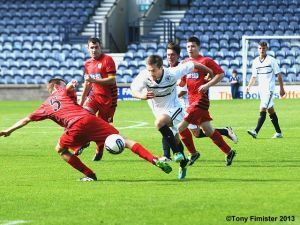 Cardle was causing problems with his every move. Right-back Gebbie may not have a longer afternoon all season – turned this way then that, Cardle was able to flight cross after cross into the danger-area. On fifty-eight minutes, another in-swinging cross narrowly evaded Smith, but Elliot finished powerfully from beyond the far-post to add a Raith third. With the visitors looking ragged, midfielder Capuano earned two bookings inside five minutes, reducing his side to ten men. The first for a trip, the second for a high and untidy challenge, the midfielder did his team-mates no favours with the game already slipping out of Queens’ reach. Calum Elliot makes it four. Manager Murray must have been pleased at the consistent drive and application from his players, notwithstanding the score-line and the visitors’ one-man disadvantage. Greig Spence was introduced for Smith, and picked up where the former Hearts youngster had left off – dropping deep to take possession, and running good angles to exploit the spaces between Queens’ tiring defenders. 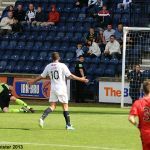 One such foray from Spence allowed Cardle to jink inside – with a sizeable gap between the visiting centre-halves, Cardle was able to play in Elliot, who rounded Brown to tap home his second and Raith’s fourth. Moments later, Spence capitalised on another defensive lapse – Greir was caught in possession near his own 18-yard line, and Spence nipped clear, taking his time to shoot beneath Brown’s despairing dive. With no numbers up alongside him, Queen’s Park’s Joao Victoria battled gamely to hold up possession to allow midfielders to advance. With his strong physique and good close control, on a different day the big No.9 would have given Hill and Watson questions to answer. With Raith now flowing with confidence and switching the angle of play more freely than in any previous game this season, the away fans held their heads in their hands as first Spence then substitute Lewis Vaughan came close to adding further goals to Raith’s already impressive tally. 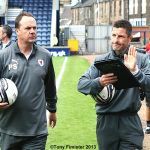 With Elliot having been withdrawn to loud cheers from the home support, substitutes Spence Callachan and Vaughan each brought fresh impetus – vigour the away defence could no doubt have done without. With time ticking down, an Anderson crossed fizzed out of Brown’s grasp with Vaughan close-by, Anderson’s headed flick was mis-hit by Spence, and Anderson himself saw an effort go narrowly wide after another cross from man-of-the-match Cardle. A final treat for the home support – with four minutes to go, Lewis Vaughan swept in from the left-flank, shrugged off one challenge, and burst the roof of the net with a fine finish. A comfortable Cup win, and a second-round tie to look forward to. 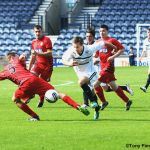 Raith fans will be buoyed by the clinical dispatch of lower-league opposition, although in truth Queens’ display reflects a team struggling to come to terms with losing two of their brightest stars in the close-season. For manager Murray, pleasure at the energy and high performance levels deep into the game’s final stages, and the contribution of all three substitutes showing genuine competition for places upfront and in midfield. Another Queens corner punched clear by McGurn. Spittal blazes well over in the follow up. 1-0 Rovers. 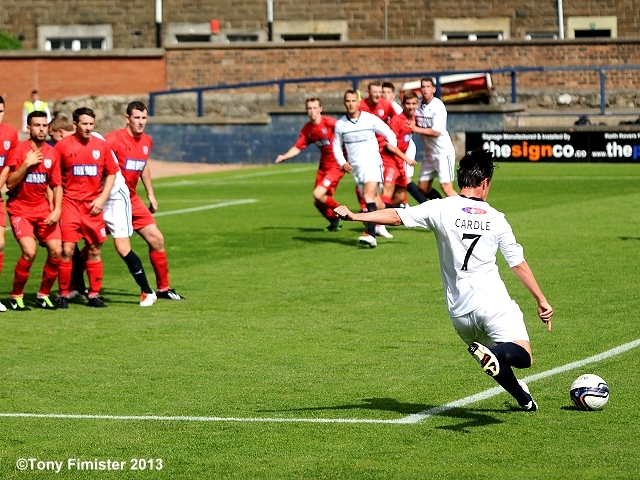 Smith glancing header from a Cardle free kick wide left. A comprehensive victory for Rovers. Cardle the pick of the bunch. 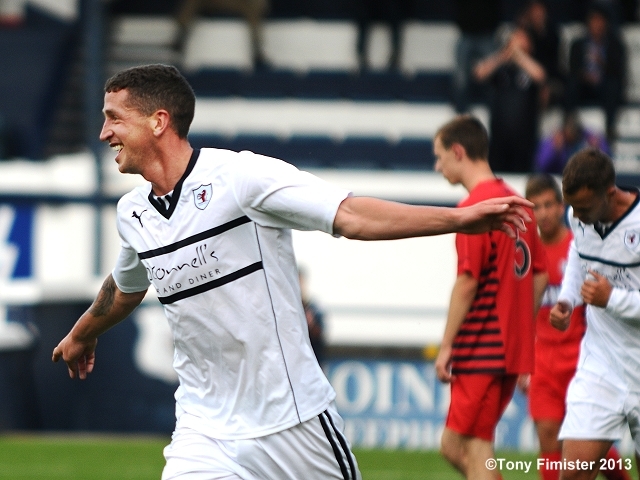 Raith: McGurn, Thomson, Booth, Fox, Watson, Hall, Anderson, Moon, Elliot, Smith, Cardle. Subs: Ellis, Laidlaw, Callachan, Vaughan, Spence. Sub Spence pulls the trigger. Grant acknowledges the fans at the final whistle.